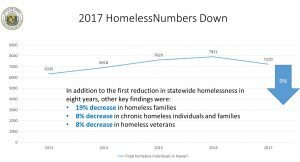 The homeless count across the state dipped for the first time in eight years. The drop is significant – a nine percent decrease for 2017 over the same period last year. “We have been working very hard to get federal, state and county officials along with service providers and the private sector to work together to reduce homelessness all across the state. So this is terrific news,” said Gov. David Ige. 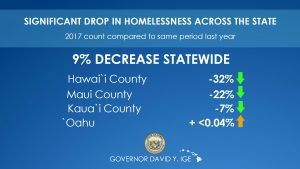 While the island of O‘ahu saw an increase of less than half percent in the number of homeless individuals, there were double digit decreases on the neighbor islands. Hawai‘i County saw the biggest decline with a 32 percent drop over 2016. Kaua‘i County a seven percent drop. “Certainly, we are beginning to get traction in the many programs that we have. 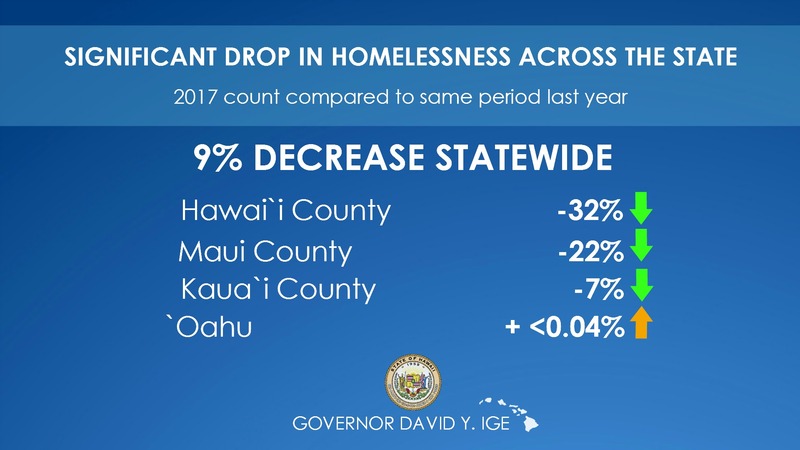 As you know, we’ve restructured all of the contracts to the service providers and are really focused on placement into permanent housing, which we know is what works,” Ige said.